Ready for an online-storage test drive? If you’ve been on the fence about which online file storage and sharing program to jump into, or you're thinking about making a switch, Walt Mossberg recently presented an overview of the top four picks in his Wall Street Journal column. 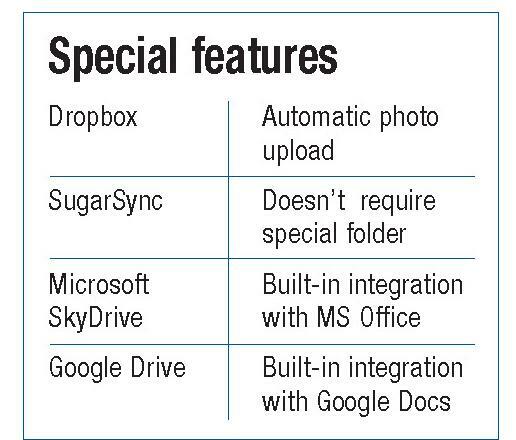 Here’s a quick look at Dropbox, SugarSync, Microsoft SkyDrive and Google Drive. 1. 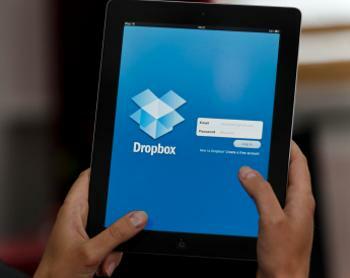 Dropbox. This is the easiest and most well-known of the group. You can keep your files in sync among several devices and computers and share individual files via links you can email or post online that will bring up the file in a browser. You can also create shared folders and automatically import photos from cameras or smartphones. Offers 2 gigabytes of free storage; $99 for 100-gigabytes. 2. SugarSync. Its Magic Briefcase is similar to Dropbox, but it synchronizes and backs up online your existing folder structure. For example, you can keep your pictures folders on a Windows and a Mac computer in sync and make them available online or through a mobile app. But linking the folders is complicated. Free for 5 gigabytes: $150 a year for 100 gigabytes. 3. SkyDrive. Microsoft’s biggest advantage is that it’s integrated with Microsoft Office on both Windows and Mac. It comes with an online stripped down version of Office that works in any browser. Any file stored in SkyDrive can be edited in your computer’s local copy of Office. It also offers the ability to edit in your computer’s local copy of Office. Files can also be saved directly to SkyDrive from Office on your computer. Free for 7 gigabytes; $50 for 100 gigabytes. 4. Google Drive. Tied in with Google Docs, this storage and synchronization service features built-in editing and collaboration, but it can’t directly edit Microsoft Office files, which must be converted to Google’s formats. Provides 5 gigabytes free; $60 for 100 gigabytes. All four storage systems provide free storage, work with both PCs and Macs, have iPhone, iPad and Android apps. What's the Correct HR-to-Employee Ratio? I second the GoodSync suggestion, you can use GoodSync to sync to any cloud storage service you use like Dropbox or GoogleDocs as well as access any local storage on your various computers over your internet connection using the GoodSync connect feature. Very useful tool for managing your backups and keeping computers/drives in sync. Been using GoodSync with dropbox and my external drives totally the way to go.